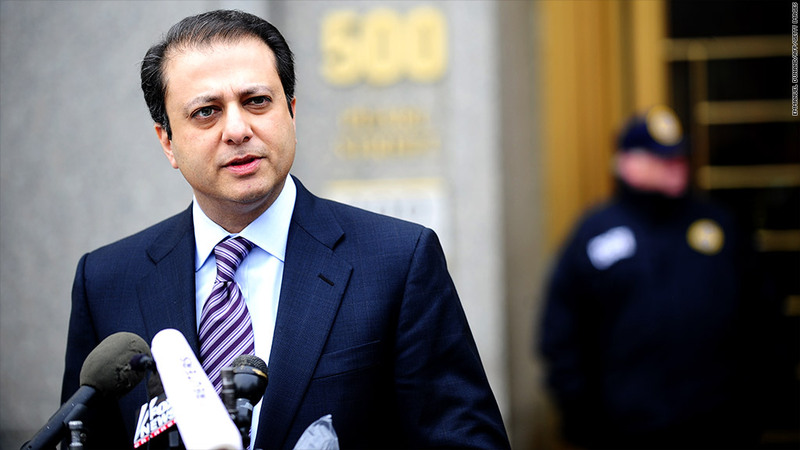 Preet Bharara, U.S. Attorney for the Southern District of New York, has charged a hedge funder in the "most lucrative" insider trading case ever, involving $276 million. Federal officials on Tuesday charged a former hedge fund portfolio manager and his firm with participating in a $276 million insider trading scheme, which they said was the largest insider trading case ever brought by the Securities and Exchange Commission. The office of U.S. Attorney for the Southern District of New York Preet Bharara charged Mathew Martoma with selling and shorting shares of the drug companies Elan and Wyeth, based on inside information from drug trials that had not been publicized. The scheme benefited Martoma's hedge fund by $276 million, according to court documents. The SEC also leveled charges against Martoma, along with the hedge fund advisory firm where he worked, which it identified as CR Intrinsic Investors LLC. That firm is a subsidiary of Steve Cohen's SAC Capital, one of the largest hedge funds in the country. According to the U.S. Attorney's office, Martoma's insider trading case is larger than the one brought against the founder of hedge fund Galleon Group, Raj Rajaratnam, who was sentenced to 11 years in prison last year for his participation in a $53.8 million scheme. Martoma was charged with securities fraud and conspiracy to commit securities fraud. He allegedly committed these crimes from 2006 to 2008, and was in federal custody Tuesday. Martoma's lawyer, Charles Stillman, denied the charges in an e-mail to CNNMoney. "Mathew Martoma was an exceptional portfolio manager who succeeded through hard work and the dogged pursuit of information in the public domain," Stillman said. "What happened today is only the beginning of a process that we are confident will lead to Mr. Martoma's full exoneration." According to the SEC, Martoma obtained inside information from a neurologist, Dr. Sidney Gilman, who was a paid consultant on Alzheimer's drug experiments by Irish company Elan (ELN) and Wyeth, a New Jersey-based subsidiary of Pfizer (PFE). Dr. Gilman has agreed to settle the SEC charges and pay more than $234,000, according to the SEC. "As Martoma allegedly got sneak peaks at drug data, he first recommended that the hedge fund build up a massive position in Elan and Wyeth stock, and then caused the fund to shed those shares after getting a secret look at the unexpectedly bad results of a clinical drug trial," said Bharara. "And so, overnight, Martoma went from bull to bear." This allowed the hedge fund to avoid $154 million worth of Elan losses and $40 million in Wyeth losses, according to the prosecutor's complaint, and to make $59 million through short selling Elan stock and $16 million by shorting Wyeth. This, combined with profits from illegal option trades, allowed the hedge fund to benefit by $276 million, according to federal prosecutors. The document said the hedge fund paid Martoma a bonus of more than $9 million in 2009, but terminated him the following year.